Audio and home theatre websites - audiotools.com. Large site that features news, articles, reviews, discussion forums and small ads section etc., recommended. Japanese website and forums, originally founded in 1999 as an AV oriented site run by Ongen Publishing which is the country's largest publisher of technology related speciality magazines, was in the beginning formatted much like a print magazine but is by now a hub for all kinds of AV electronics including hi-fi and digital cameras even through the main thrust of the site is still home theatre. Very popular in its home country and sometimes covers what we would consider minor events in the west, like the introduction of a new HDMI cable, in obsessive detail complete with interviews and background info. The site has a great coverage of Japanese trade shows and often reviews "in bulk", i.e. a range of devices in one review rather than just one, but note that reviews of larger devices seldom appear on the site as to not compete with the print magazines the Ongen company publishes. 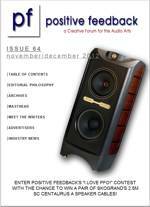 Canadian webzine focusing on high end audio that started out as a print magazine called FM Guide later renamed Audio Ideas Guide but stopped issuing print versions in 2007. Some interesting reviews every now and then of hardware that you will not easily find in other publications. USA based home theatre, hifi, movie and music review and news site, although it is not mentioned on either the site or on the IB homepage, AV Revolution is actually a pro operation run by Internet Brands, Inc., a company that runs a some 200+ special interest sites, rather than the usual setup that is run by a small team, an individual or is affiliated with a print media firm. IB actually hires self-employed writers to review equipment on a one off basis, one or 2 of them with a long association with the AV press, others picked off fresh from the blogosphere. The sites primary worth is as a news and film review site, those 2 sections are constantly updated, the hardware reviews are showing up less and less frequently however and the newest music reviews is over a year old when this was written, and the last SACD review was written in 2005. The site also features a forum but it is a fairly low volume one. Tel: +1 800 692 2200..
English language hi-fi webzine that focuses primarily on high end audio products and often on the ultra high end of the spectrum, although there are some mid-fi products discussed and reviewed. The most interesting aspects of the site are actually interviews and show reports from the various central European hi-fi shows but some of the reviews are worth a read as well if a bit emotional at times. Webzine published bimonthly, strictly oriented towards the high end audiophile and with an emphasis on analogue and SACD playback, lots of hardware reviews and quite a few music ones as well, but very USA centric. Started out as a print magazine in the early 1990's but converted to an online only zine in 2002 and in that same year took over rival magazine audioMUSINGS. The magazine has also more recently started offering podcasts, consisting mostly of interviews with people in the audiophile record business. A hub for a collection of sites that individually focus on an aspect of the hi-fi world, with Ultra Audio covering high end audio with the occasional Jazz audiophile review thrown in for free, the Soundstage Hi-Fi site emulates a traditional hi-fi rag with a blend of mid and high range reviews sprinkled with lots of opinion pieces and the odd classical music review, the GoodSound! site focuses on budget audio with rock album reviews in-between, the Soundstage Global site has factory tours and show reports, despite the name these are almost exclusively from Northern America, and the last site they run is SoundstageXperience which bundles together all the non-traditional hi-fi separates stuff such as home theatre, personal audio, computer audio and portables alongside the odd Blu-ray and music review. All the sites have the same basic writing team although each has a separate editor and all are the same format, i.e. they emulate a traditional hi-fi/AV magazine in having hardware and software reviews alongside opinion pieces, interactions with the reading public go through a separate letters page rather than on article/content as with most websites, and so on. The good aspects of the site (sites?) are the reviews, they are fairly professionally done although a bit limited in scope at times, and you do get provided with test data in some cases especially the speakers, where the site takes advantage of the fact that the Canadian National Research Council runs an excellent anechoic chamber in Ottawa that they rent time out in at quite reasonable prices. The negative points are that the reviews are not quite up to the scope, quality and length of what we expect from the printed press, although they are not far off really and we would especially like to see waterfalls in the speaker reviews, FR plots only show if something is seriously wrong and few speakers are that bad these days. Still is should be noted that while the reviews are perhaps not always up to the standards of the printed press they are nevertheless a class above their competitors on the net. The high ratio of reviews featuring equipment from site sponsors and factory tours from the same is a tad irritating as well. What really is lacking are interactive features and that has quite obviously hurt the operation since the sites readership has been falling over the years while most other audio related sites have been growing their readership, this is especially notable for the AV part of the network which around 2000 looked like it would become more popular than the hi-fi part, but Soundstage was at that time running 2 separate home theatre sites in addition to further two that contained some AV content. The problem is that the more popular AV sites out there have leveraged simple interactive features such as forums and in page comments to increase their readership, simply because where some user interactions are provided, punters show up more often on the site than with published content only. We are willing to bet however that Soundstage is going at the least partially interactive in the near future, they recently switched to a content management system called Joomla, that is both buggy and just about the slowest CMS out there, its only saving grace is that it has a rich variety of interactive features available, both in the basic system and as extensions, so the fact that the company has chosen that CMS over something more scalable like Dupal or Typo3 speaks volumes. Run by Canadian company Schneider Publishing Inc., not to be confused with the USA based newsletter publisher of the same name, and despite originating in Canada the permanent writers are largely from the USA. This operation started out as a monthly webzine in 1995 published by Kanuk hi-fi nut Doug Schneider and called simply Soundstage!. It was, to be frank, a bit dull at the time and would probably have sunk fairly quickly in todays market but since there was a dearth of audiophile material on the web in the mid 90's it hit the right spot at the right time which meant that as early as 1998 the site was one of the 2 largest audio equipment related sites on the net. The operation expanded by adding a number of sister sites which in retrospect may seem a bit off since it breaks one of the rules of publishing "do not water down your brand", however this made perfect sense at the time. People had not yet started using search engines as their primary gateway to the internet but mostly relied on links, either from other homepages or from link hubs such as Yahoo! & DMOZ, so as odd as that may seem today, the more separate landing pages and domains you had the larger the potential audience. Soundstage used to have even more sites that it has now, for starters there was a specific PDF version of soundstage that you could access under "soundstagemagazine.com" that the company announced would be sold rather than a free download but it is not known it that was ever implemented, then there was "Home Theater & Sound" which was the main home theatre offering but was later merged into SoundstageXperience. "SoundstageAV.com" was a sort of a review archive site that collected most of the reviews that appeared on the other Soundstage sites and so was "AudioVideoReviews.com" but a bit earlier if we remember it correctly,"reviewerschoice.com" on the other hand collected the accolades that the various Soundstage sites had awarded equipment. "Onhifi.com" and "Onhometheater.com" were another hi-fi and AV reviews and opinion sites edited by Wes Phillips who is a well known personality in the USA audiophile press, "mastersonaudio.com" and "mastersonvideo.com" was a similar publication but edited by Canadian veteran Ian G. Masters. , "AudioVideoNews.com" was an audio and home theatre news site, the company still uses the brand but not the domain, the news content is now on the main Soundstage Network domain. "Planet Hi-Fi" was published between 2002 and 2004 and featured the writings of Greg Kong, the company has a full archive of all the Planet Hi-Fi issues located here. "SoundStageLIVE.com" appears to have bee a predecessor to Soundstage Global. And there were other Soundstage controlled sites that no-one can remember what function they performed such as "AudioVideoTrends.com", we think that was a "digital" site with coverage of satellite radio, iPod's and so on, but honestly we no longer remember, or care for that matter. While "audiovideodirectory.com" was a sort of a directory site that took over from an earlier incarnation called "avgateway.com" and there was a site that collected information on and links to retailers called "AudioVideoRetailers.com". The company actually held out a host of other domains such as "AudioVideoAnswers.com", "AmplifierMeasurements.com", "PreAmplifierMeasurements.com" "SpeakerMeasurements.com", "AudioVideoShows.com", "Goodsoundguide.com", "RecommendedComponents.com " some of which were only developed for a short while and others were never developed but simply pointed to resources on other soundstage sites. The company begun to trim the number of sites they operated around 2003/4 and again around 2011. Audiophile review site, although the site does review music releases , primarily jazz, classical and "audiophile" releases these are of a bit indifferent quality and its primarily primary worth is as a high end equipment review site. Not only does the site have a large number of reviews available dating all the way back to 1999 but they are often quite good as well. Comment/opinion pieces are offered there as well but while some of them are interesting the thing is the net is sort of full of opinions .... and these are not that different really. Highly recommended reading but arcane design makes the site less easy to traverse than it should. German website that has one of the biggest high end review section in the world alongside other articles, news section etc. Polish webzine published monthly in English and fortnightly in Polish, covers high end audio equipment almost exclusively with only the occasional mid-fi getting a mention in the Polish version only. Note that the Polish language version gets more articles and is better updated than the English one but the latter is still worth a read. Canadian website that reviews high end audio equipment and audiophile recordings in addition to reporting on audiophile shows and the like. Originally set up like a web magazine but these day’s is firmly a blog. Audiophilia Inc., Suite 6, 2700 Battleford Road, Mississauga, Ontario L5N 2S7, Canada. Tel: +1 647 284 5414. E-Mail: info at audiophilia.com. A blog written by the director of research at Harman International, the author is very interested in the perception of sound rather than psychoacoustics per se. No relation to the old audioMUSINGS magazine. A fairly recent (Q3 2012) classified ads site that focuses on high end audio, is attempting to muscle in on the market by offering free sales listings. AudioTech Industries LLC, C/O David Picarsic, 3142 Village West Drive, Augusta, Georgia 30907, USA. Tel: +1 706 962 0067. E-Mail: dpicarsic #at# yahoo.com. Long running if at times a little brain-dead web CD review zine and podcast that covers industrial and experimental music, originally a print publication started by Frans de Waard in 1987 as just Vital that had more content in it than just reviews but was converted into an e-mail publication in 1995 that was published on a weekly basis and is now web accessible. These days’ Vital only reviews of CD’s, other formats including MP3 etc. are not catered for which is a bit perplexing given Vital’s origin in K7 Culture.